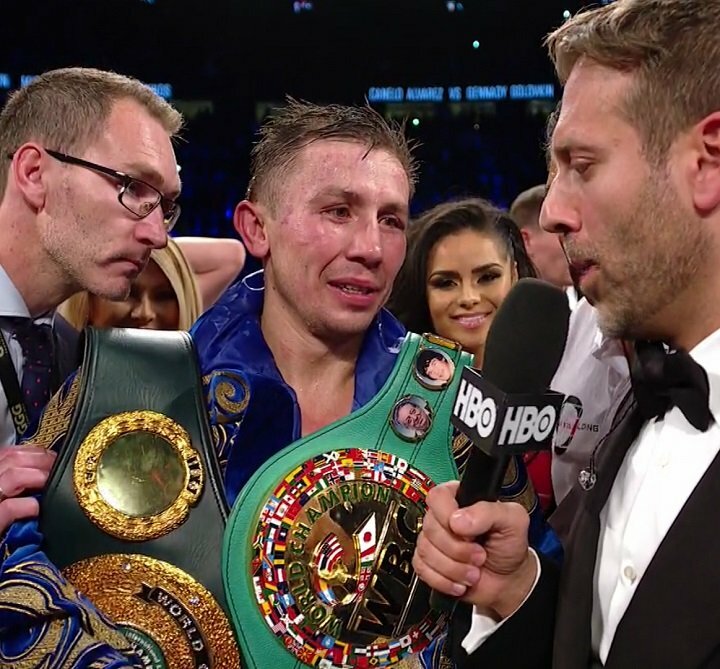 By Sean Jones: Gennady ‘GGG’ Golovkin could go after the winner of the World Boxing Super Series super middleweight tournament, says his promoter Tom Loeffler. Michael Benson is reporting that Loeffler is saying Golovkin (37-0-1, 33 KOs) could go after the eventual winner of the WBSS. However, that won’t be until later this year, as the WBSS tournament still needs to be played out before that’ll happen. The winner of the WBSS super middleweight tournament is expected to be either George Groves or Chris Eubank Jr. Golovkin was close to fighting Eubank Jr. in September 2016, but the fight didn’t get made. Golovkin fought Kell Brook instead. In the meantime, Loeffler is still trying to pound out a contract in his negotiations with Golden Boy Promotions for a rematch between Golovkin and Saul ‘Canelo’ Alvarez (49-1-2, 34 KOs) for May 5 on HBO pay-per-view. Loeffler has been hard at work with Golden Boy president Eric Gomez for the last 3 months trying to get the Canelo-Golovkin rematch negotiated. As of last week, Loeffler said the Canelo vs. Golovkin 2 negotiations are “90 percent” completed, and he’s hoping to get it across the finish line. However, it’s about to turn February this week, and they’re clearly running out of time to get the Canelo-GGG rematch done in time to properly market it to the boxing public to make it a bigger fight than last time. You have to believe if that fight isn’t done soon, then it might not happen. There’s still time right now to get it done, but the longer it takes the less time there will be for Golden Boy and Loeffler to promote it into as big as match as last September’s fight between them. Golovkin and Canelo fought to a 12 round draw last September in Las Vegas, Nevada. The rematch between them is to clear up the controversy surrounding their controversial draw. The boxing public thinks Golovkin should have been given the victory. I suppose if the fans felt that Canelo deserve the win, there won’t be a rematch. Golovkin has sparred with Groves in the past, and there are rumors that he hurt him with a body shot to the ribs. That was a long time ago. Groves is older now at 29, and he’s now the WBA World super middleweight champion following his 6th round knockout win over Fedor Chudinov last year in May. Groves has won his last 6 fights, and he’s coming off a 4th round knockout over Jamie Cox in the quarterfinals of the WBSS last October. Groves stopped Cox with a hard body shot.